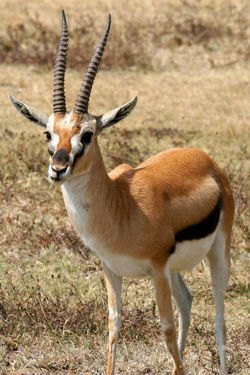 Gazelles are mammals which are closely related to antelopes. They live in herds mainly in the dry areas of Africa and the southwestern part of Asia. They are most recognized for their "swift movements" and unique features. The largest species of gazelle is the rare Dama gazelle. Many of these gazelles, however, are or are becoming extinct due to significant amounts of change. Though there are many unique species of gazelles, they all share common features. Perhaps the most recognizable of these features is its horns. In many species, large rings encircle the long horns. These horns are not shed, but instead keep growing throughout their lifetime, which is about 12 to 17 years depending upon if they live in the wild or are in human care. Though it is more common for males, females may also have a pair that are smaller in size. However, some female gazelles, such as the Persian (or goitered) gazelle, lack horns. Seperate species of gazelle's have unique ways of mating during the breeding season. For example, the male Goitered (Persian) gazelle's get their name because of the swelling of the larynx during this time. This particular species can have up to four babies. As with all mammals, the gazelle reproduces sexually. They are viviparous, meaning that they give birth to live young. Gazelles are known widely for their unique ways of mobility. Various ways include jumping, running, and "pronking" (when the gazelle jumps and lands on all four feet at the same time). They have a very keen sense of seeing and hearing which enables them to locate their predators and get away more easily. This page was last modified on 1 September 2014, at 20:38.